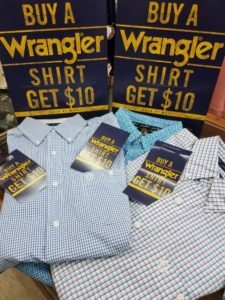 Save on Wrangler Shirts! For a limited time, whenever you purchase a Wrangler shirt you will get $10. These Wrangler shirts are stylish and would make a perfect gift for that special someone. You can even treat yourself to one. Whether it is a birthday gift, or for Valentine’s Day this is a perfect way to make your loved one smile. Contact us or come into the store for more info. In addition, follow and like us on Facebook to learn about more sales and discounts like this. This entry was posted on Friday, January 25th, 2019 at 10:58 am	and is filed under News & Updates. You can follow any responses to this entry through the RSS 2.0 feed. Both comments and pings are currently closed.